INTERLAKE, Canada -- James Bezan, Member of Parliament for Selkirk-Interlake is deeply troubled by the latest example of the deterioration of democracy and rule of law in Ukraine. 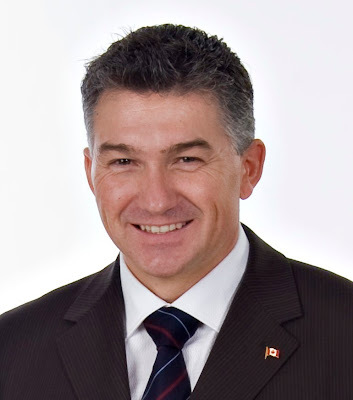 James Bezan, Canadian Member of Parliament. On February 29th, in the most recent example of politically motivated attacks by the Ukrainian Government, former Minister of Interior and opposition leader Yuri Lutsenko was sentenced to 4 years in prison for abuse of office and embezzlement. “It is undeniable that the current government in Ukraine is on a politically motivated mission to silence their opposition,” said Mr. Bezan. Yuri Lutsenko and recently imprisoned former Prime Minister Yulia Tymoshenko were allies in the 2004 Orange Revolution that saw the overturning of the controversial 2004 Presidential election, thwarting a first bid for the presidency by current president Victor Yanukovich. “The fact that those being imprisoned are political opponents of President Yanukovich, and Lutsenko’s alleged offences includes charges that were as miniscule as illegally granting an apartment to his driver, show that the trend of political repression in Ukraine is continuing, not ending,” said MP Bezan. Valery Ivashchenko a former acting defence minister under Tymoshenko has also been in detention since August 2010. Ms. Tymoshenko is also currently being held in a labour camp in Ukraine where she is reportedly in poor health. The former Prime Minister’s daughter, Yevhenia Tymoshenko said German doctors diagnosed her mother with a hernia that has gone untreated. Tymoshenko’s family says she is in severe pain that is preventing her from walking or sleeping properly. “The treatment of Ms. Tymoshenko is absolutely appalling,” said Mr. Bezan.